I posted this article on Siam Voices, Asian Correspondent on Monday and added an update on Tuesday. The political situation has been fast changing. By Wednesday night the street protests have cooled down. For those who are still wondering what has been going on in Thailand during the past few weeks, I hope this article helps shed some light on the rather complicated Thai political turmoil. Here we are, barely two years after a general election Thailand’s elected government is once again looking unstable. Just a week into noisy street protests led by the opposition party, it’s becoming increasingly clear that the calls to remove the controversial amnesty bill have turned into shrill demands to remove the government itself. Are we seeing a game changer? A real showdown many have been waiting for? The ruling Pheu Thai Party got itself in this fix by passing the highly controversial amnesty billwith radically altered content to clear the way for its boss-in-exile Thaksin Shinawatra to return free of jail time and legal charges. The way Pheu Thai rammed the bill through parliament and the wholesale nature of the proposed amnesty that undermines justice and strengthens impunity were so ugly that it’s no surprise the bill drew an instant backlash from all sides, although for different reasons. Pheu Thai’s amnesty bid for Thaksin has to be the stupidest, most reckless and selfish gamble it has ever made. By now it is clear that Pheu Thai’s (or Thaksin’s) hubris in believing that the majority in parliament was enough to ram the bill through both the lower and upper houses was a colossal mistake. The radioactive amnesty bill galvanized anti-government protests that have hitherto failed to find an issue to gain traction. The amnesty bill to whitewash Thaksin was a godsend for the opposition. 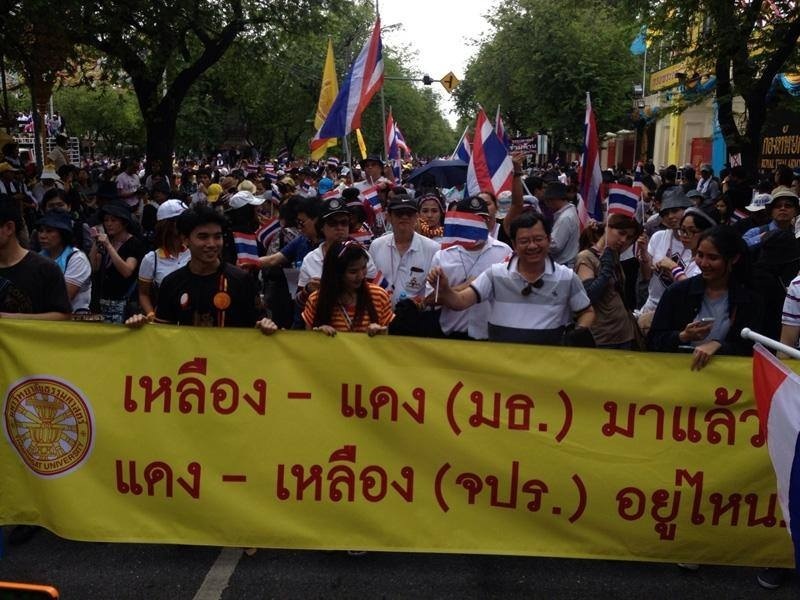 Semi-dormant anti-government forces have now been awakened and brought onto the street in the tens of thousands. Pheu Thai surely expected protests from the opposition but it underestimated the ability of anti-government forces to capitalize on their political blunder, and the veracity of its own support base. Perhaps it fell into the trap of wishful thinking that a small number of its red shirt supporters would oppose the bill but not enough to balloon into a political crisis. As it turned out, many redshirts, especially the progressive and influential opinion leaders, were furious. Even the usually compliant UDD (United Front for Democracy against Dictatorship) red shirt leaders and MPs in the Pheu Thai Party were openly critical of the bill. A close alliance between Pheu Thai and the red shirts suddenly appeared vulnerable. No one with any credibility stepped forward to defend the bill. Crucially, as anti-amnesty protests were swelling and getting louder, more and more senators vowed to reject the bill in the Senate. Although the lower house has the power to overturn the Senate, Pheu Thai could see that pushing through “the end of the soi” was not the way to go. It had no choice but to back down, agreeing to immediately withdraw all amnesty-related bills from parliament and not to resubmit any once the one now in the Senate has been rejected. What a humiliating retreat that was. The Democrats have months ago thrown down their gloves to enter street politics in a new gambit to fight the government. Now finally armed with an electric cause to galvanize its supporters to join them on the street, they hope they’d been delivered a game changer. Various groups have come out in tow, issuing one statement after another against the amnesty bill: university lecturers and students, journalists, doctors and nurses, business people, state enterprise workers, celebrities, and even judges. It’s a moment the opposition has long been waiting for. Drawing on the disgust with the bill as much as the hatred for Thaksin and Yingluck’s government, the Democrats have rallied the anti-amnesty groups to join the whistle-blowing campaign against amnesty to whitewash corruption. The campaign proved a success with a spectacle of photogenic young office workers and students filling up the street in a carnival-like rallies in Silom and Sukhumvit during lunch time. The shrieking noise of the whistle blows against whitewashing Thaksin’s corruption and evils has drowned voices in smaller protests earlier against injustice and impunity for killers and perpetrators of violence. Seeing Suthep Thuaksuban leading a protest against corruption is like watching a wolf in grandma’s clothing leading little girls in a red riding hood in a protest against trickery (only the hood is any color but red). Quite amusing considering Suthep has his own list of corruption charges in his bio and a son ensnared in a forest encroachment case. The Democrat Party also has a large share of corruption-ridden mega-projects. But facts that might produce irony and cognitive dissonance seem lost on the excited whistle blowers. What “protest upgrade” really means became clear over the weekend. On Friday, when the new anti-amnesty and the existing anti-government protests converged and moved nearer to the Government House, Suriyasai Katasila, one of the yellow-shirt leaders of the supposedly defunct PAD (People’s Alliance for Democracy) who joined the group at Uruphong, said the protest would not stop with the withdrawal of the amnesty bill. Now three protest groups are stationed around the Government House area, the Network of Students and People for Reform of Thailand (NSPRT) and the Anti-Thaksin Coalition at different locations on Rajdamnoen Nok Avenue, and the Democrat Party rally at the Democracy Monument on Rajdamnoen Klang not far away. The protests may have new names but the key leaders are old faces. Old PAD leaders like Chamlong Srimuang and Sondhi Limthongkul, the Democrats’ off-and-on allies, have come out of the woodwork to join the assault on the government. In the Senate, the rejection of the bill was made loud and clear—repeatedly, by the Senate Speaker and a number of senators. It looked near certain that the amnesty bill would be completely and utterly rejected by a large majority of the Senate. A senate meeting was called at 2pm on Friday but after two hours of waiting the meeting was cancelled due to lack of quorum. The expected rejection of the bill in the Senate descended into political farce, as the Group of 40 Senators (mostly appointed) who vowed to kill the bill as soon as it reached the upper house less than 24 hours earlier refused to enter the Senate chamber, sitting in a room not more than 100 meters away. By Sunday amnesty was no longer at the center of attention. The protest intentions were now made clear—to overthrow the government. Three protest groups—the Anti-Thaksin Coalition, the People’s Democratic Force to Overthrow Thaksinism and the Dhamma Army (remnants of ultra-nationalist, ultra-royalist PAD factions)—have issued a statement that their protests aim to oust PM Yingluck, the house speaker and the senate speaker from office. This was afterfour government coalition parties signed an agreement not to reaffirm the amnesty bill after it is rejected and returned by the Senate to the House of Representatives. Hideous as the amnesty bill is, it has its uses. It has shown the true colors of many key players in the Thai political theater. As hidden and not-so-hidden agendas are exposed, the amnesty unveiling shows in which corner each player truly stands. 1. Pheu Thai’s ugly true self was unmasked to its supporters: when (Thaksin’s) push comes to shove it chose political expediency and Shinawatras’ interest above all else. Pheu Thai has shown to the dismay of its red shirt supporters that it is entirely capable of throwing them under the bus. But it has also shown that it can back down when necessary, though at the price of freedom for hundreds of its supporters who will continue to languish in jail given the amnesty bill will most likely be rejected in the Senate. 2. The red shirts were put to a test: stand by principle or personality. A number of progressive redshirts have angrily slammed Pheu Thai for betraying and insulting them with the amnesty bill; many vowed not to vote for the party next time. Some have advised their fellows to make a distinction between supporting and being a blind follower of a political party. But the advice didn’t stop the criticisms and attacks by the blind followers who think loyalty means no disagreement or criticisms. In parliament only four UDD MPs had enough “courage” to abstain from vote on the amnesty bill, while at least a dozen other red shirt MPs voted in favor of it. The amnesty bill has sorted out democracy lovers from personality cult worshippers and pragmatic political players among the redshirts. On Sunday around five thousand joined the progressive red shirt protest against the amnesty bill in Rajprasong where the Red Sunday group leader, Sombat Boon-ngamanong, demanded an apology to redshirts from the Pheu Thai government and an idea of redshirts having its own party was floated. In another location in the same evening, at least 50,000 joined the UDD rally to show support for the government. 3. There is not much to be exposed for the opposition party, the Democrats, for they have made it clear what they want—to get rid of the government by any means necessary, including extra-parliamentary and undemocratic means. But some things that the Democrat leaders have said in the past few days confirm that truth and reconciliation is just a concept with no practical use. The words of the Democrat Party leader Abhisit Vejjajiva spoken on the rally stage last night also show that he exists in an alternate reality. “If there is even one dead protester, don’t even hope to continue living in this land, the whole [Shinawatra] clan!,” shouted the former prime minister who presided over and refused to take any responsibility for the protest crackdowns that left over 90 people dead in 2010. Perhaps Abhisit believed Suthep’s tale that the protesters “ran into bullets,” despite court findings of at least some deaths at the hand of security forces. 4. The beautifully organized whistle-blowing flash mobs started out with a “No to Blanket Amnesty” slogan but the loud shouts quickly turned into “Get out.” It’s transparent behind the kill-bill whistles and lunch-time photo-ops lies more hatred for one man than a care for democracy and justice for all. The anti-amnesty whistle-blowers are photogenic, but listening more closely to their words one realizes that appearances of intelligence and education can be deceptive. Inside the elevated mood of the street demonstrators fester an elevated sense of self-righteousness, shallow slogans, and nauseating narcissism. The whistle blowing protesters have been telling each other and anyone who would listen that theirs is a protest by “good people,” “not brutes.” “We are rich and educated,” they said, not tools of corrupt politicians (like the poor, uneducated, not-good, uncouth people on the other side). Some put their thoughts onto personal placards to make sure the world knows: “I am not hired because my salary is big,” “my family is rich,” etc. As though being rich, privileged, educated and well-dressed with a monthly salary were requirements for justice and democracy. Scratch the surface of this inflated self-image and find the contempt for the opposite of “us.” Parallel to the pathological obsession with Thaksin’s evils is the glaring omission of the evils of those on their side, and the loss—deaths and suffering—of the fellow women and men on the other side. Within their black and white, self-absorbed world, there is little room for empathy. 5. The so-called guardians of democracy have shown their true colors too in bright neon especially on Sunday, when the group of appointed Senators boycotted the senate meeting to deliberate the bill, although doing so would help solve the problem according to the rules of parliamentary democracy and calm down the situation. But that apparently was not their role. Rosana Tositrakul, a key member the Group of 40 Senators, said the group refused to attend the meeting because the amnesty bill was “the government’s problem,” not the Senate’s “burden.” Shortly after she told the press that the situation has already “gone beyond amnesty bill”, calling the government to dissolve parliament, echoing calls by some supporters of the opposition. This foot dragging coincided with Suthep’s plan to keep the protests going strong until Monday evening for the much awaited ruling on Preah Vihear by the International Court of Justice (ICJ) on late Monday, which is expected or hoped to add more fuel to the anti-government fire. Many institutional anti-amnesty groups’ swift and loud condemnation of Pheu Thai’s ill-conceived amnesty bill is a stark contrast to their deafening silence when the coup makers gave themselves a complete amnesty written in the Constitution (Article 309). In fact, some behind their institutions’ stance against the amnesty were in a drafting committee of the post-coup Constitution. The fact that Thammasat University students were holding a protest banner calling for military cadets to join them in protest suggests that a course on irony ought to be required at the university. Youthful ignorance and bias can be easily forgiven, but in esteemed adults the ignorance and bias injures credibility. That 63 judges actually signed a public petition against a proposed law pending in the legislature is staggering. It shows just how Thai judiciary still has a long way to go before it can expect judicial impartiality. And what with the former foreign minister and ASEAN secretary-general Surin Pitsuwan comparing the Pheu Thai government to the Hitler dictatorship? One would have thought a person of his experience and stature would know better than that. The Preah Vihear factor – a game changer or a groundhog day? Surely the opposition coalition would like what the amnesty bill has unleashed to be a game changer. As the Senate was expected to be deliberating the bill until late night today (Monday), the anti-government and anti-amnesty protests have converged on Rajadamnoen Avenue near the Government House. All were awaiting the ICJ ruling (the anti-government forces have been pushing the Thai government to reject the ICJ ruling for months expecting it to be unfavorable for Thailand), and the former PAD protest groups said they were ready to move to the Government House once the ICJ verdict on the disputed 4.6 sqkm area around Preah Vihear was issued (a unanimous verdict was issued on Monday just before 5pm confirming the 1962 ruling and recommended Thailand and Cambodia to manage the Preah Vihear heritage site together). The government has urged the opposition not to use the ICJ ruling for political gain, but that’s exactly what has been planned all along. On Sunday Senator Rosana told the Thai public not to accept the authority of the ICJ. International law is likely to be ignored in favor of nationalistic, emotional reaction to give the opposition a base to keep the whistles blowing and the street court in operation. The thirst for blood within the fanatical ultra-nationalist groups within the opposition coalition (they have called for the military to defend Thailand’s sovereignty at all costs) is in contrast to the Thai and Cambodian governments’ careful handling of this hot-button issue. As the country awaited anxiously for the situation to unfold in the evening on Monday, Sondhi announced the PAD stance on the whole situation that Thailand should “suspend the parliamentary system for 2-3 years, return the power to the King, and set-up a caretaker government.” Western-style democracy does not work for Thailand, Sondhi said. According to The Nation reporters, six Democrat MPs including Suthep are said to be resigning from parliament to step up their fight this evening. It seems at least one side is eager for an all out war. But will the same old bag of political tricks that worked in 2008 which put the Democrats in power work in 2013? The political conditions are not the same as five years ago. The military has stayed in the barracks, having been appeased by Pheu Thai. The larger public appetite for a coup as a political solution is not what it once was. 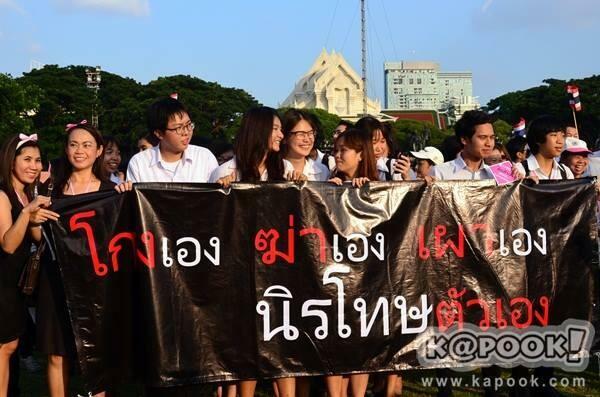 However, the word ‘never’ can never be used when it comes to the possibility of a military coup in Thailand. Most Thais are weary of violent conflicts and don’t want to see any more bloodshed. The ongoing coordinated effort to organize a putsch by the opposition coalition may seem like a groundhog day and but at least for now it’s more likely than not that the Pheu Thai government will manage to stay in power. In the next few days we will see to what extent the opposition can rouse nationalistic fervor to sustain street demonstrations. If the pressure from the protests proves too much, Yingluck has an option to dissolve parliament and call an election. Her party would likely prevail again. The protest overreach by the opposition has pushed many red shirts and likely also the swing voters furious with Pheu Thai just a week ago back to support Pheu Thai once more. For most Pheu Thai supporters, the electoral majority, it’s the matter of electing a government that they can vote out of office. Street courts and a self-selected government of so-called good people isn’t an alternative that the majority of Thais are willing to contemplate as a fair trade for giving up their right to vote. The Senate unanimously rejected the amnesty bill on Monday night, and Suthep and 8 other Democrat lawmakers resigned as MPs “to lead the protest against the amnesty bill” (although the bill has already been rejected by the Senate). Suthep has called for a national work stoppage and delaying paying taxes as part of a civil disobedience campaign against the government, reported the Bangkok Post. It seems that some groups of whistle blowers are no longer keen to be part of the anti-government putsch by Suthep and the extreme nationalists. The Business Club for Democracy, a key group in the Silom whistle blowing protest, has announced it would stop protesting as its purpose has been achieved with the amnesty bill being put away. More may have decided to stay home quietly. Meanwhile, Thai business sector is alarmed by Suthep’s idea of a work stoppage. Business leaders have called for an end to the political demonstrations. This might be giving the Democrats a second thought, we will see. However, the die-hard anti-government groups are boldly pushing forward. They have submitted a petition to the palace asking His Majesty the King to allow or a “people’s council” to run the country in place of the current government. The constitutional amendment legislation was approved by parliament in late September and forwarded to the palace for royal endorsement in early October. The amendment legislation is still awaiting royal endorsement and how the Constitutional Court rules in about a week’s time will signal whether Thailand will be moving into a deeper political uncertainty or the situation will cool down and the parliamentary system is allowed to run its course. *Note: Thanks to a reader for a reminder on the judicial coup aspect. good article. current govt has to be totally blind to make these late changes in amnesty law. perhaps hubris too of Thaksin. both major parties really care for their own set of elites / kleptocrats. masses are simply tools in hands. I also think you may have taken a bit to much liberty in what you say that the student groups were implying by statements about them having their own money and not being paid to protest. Hi JD Call, Thanks for sharing your opinion. There are examples of “undemocratic” actions the Democrats have taken, one being often relying on the courts to interfere with the legislative branch. I did not give examples because the article was already long and those following Thai politics have some idea of what those are. The one that says “My family is rich” is on a placard held by a school boy in uniform, no more than 10-11 years old, and I won’t link to the picture because he’s a child. The lines “We are rich and educated” were widely referenced on social media, and I have a specific source, someone who got a letter from a protester sending him email using those precise words.